Hey Students! Welcome you on this page. In this article going to update you about the Intermediate admission. Students who passed class tenth/Matriculation Compartmental Examination 2018 and want to admission in the class 12th Arts / Science / Commerce then they can apply for the admission. Bihar School Examination Board, Patna has been open the link for the students to apply for the admission in the Intermediate first year through the BSEB OFSS. This the Common Application Form for taking admission in 10+Two course. Students who wish to get admission to the BSEB running colleges or school have to go through the BSEB OFSS Intermediate CAF. After the apply for the admission in intermediate Board will be releasing the cutoff and merit list for the students to take admission. Board will be do counselling for the admission. Counselling will be done through the ofss application and Students marks and choice which they applied for the admission as per their stream and school/college. To apply for the admission you can get all process stepwise on this page. If you wish passed in the Bihar Board class 10th Compartmental exam and want admission in the intermediate and want to apply for common application form then you can get all detail here for apply at www.ofssbihar.in. 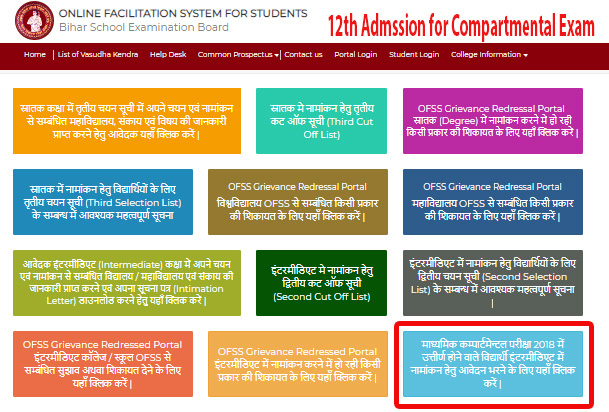 Students who want cut off district wise and college wise then they can get online on the website of OFSS. Students who have any more query about the admission in the admission they can ask from the official member of BSEB OFSS, If you have any query then you can ask though comment. Stepwise process for apply BSEB OFSS Common Application Form for Intermediate Admission, After login this page scroll down the page for all detail and making payment for admission in intermediate first-year session 2018-20. Want to know any update regarding Bihar board regarding admission or any other then you can ask by the admin of this website by commenting, a link has been given below.